description-1 = Avalon 2019 Expo and Airshow provided Defence and industry with the opportunity to demonstrate the next-generation of Australian and allied air combat capability. Image Shayne Wright. description-2 = A Royal Australian Air Force Airbus KC-30 Multi Role Tanker Transport (MRTT) conducts a low fly-by with a BAE Hawk Lead-in Fighter, Boeing F/A-18 Classic Hornets, a Boeing F/A-18F Super Hornet and the future of Australia's air combat capability, the Lockheed Martin F-35A Joint Strike Fighter. Image Shayne Wright. description-3 = The Airbus-designed KC-30A MRTT is fitted with two forms of air-to-air refuelling and is capable of carrying more than 100 tonnes of fuel. KC-30A can refuel a range of compatible aircraft, including; F/A-18 Classic Hornets, F/A-18F Super Hornets, E/A-18G Growlers, E-7A Wedgetails and C-17A Globemaster IIIs. Image Shayne Wright. description-4 = KC-30A can remain 1,800 kilometres from its home base, with 50 tonnes of fuel available to offload for up to four hours supporting Australia's expeditionary air power capabilities. The KC-30A is also compatible with refuelling P-8A Poseidon surveillance aircraft, F-35A Lightning II, and foreign aircraft such as the F-16C Fighting Falcon and B-1B Lancer. description-5 = The RAAF's fleet of 71 'classic' Boeing F/A-18A/B Hornets have served as the back bone of Australia's air combat capability since their introduction in 1984. Based at RAAF Base Williamtown, NSW and RAAF Base Tindal, NT, the classic Hornets are operated by No. 3 Squadron, No. 75 Squadron, No. 77 Squadron and No. 2 Operational Conversion Unit. Image Shayne Wright. description-6 = The RAAF Hornets undertake a variety of mission profiles, including air interception, air combat, close air support and interdiction operations. The Hornet has a top speed of Mach 1.8 (2,200km/h) with an interdiction range over 1,000 kilometres and a combat radius of 740 kilometres. Image Shayne Wright. description-7 = Australia's fleet of Hornets have been supported by the introduction of the larger, twin-seat, Boeing F/A-18F Super Hornets. The RAAF operates a fleet of 24 Super Hornets based at RAAF Base Amberley, Queensland. Image Shayne Wright. description-8 = Like the Classic Hornets, the Super Hornets undertake a variety of mission profiles, including air interception, air combat, close air support and interdiction operations. The Super Hornet has a top speed of Mach 1.6 (1,960km/h) with a range of 2,700 kilometres. description-9 = The E/A-18G Growler is a specialised electronic attack variant of the Super Hornet. The RAAF operates a fleet of 11 Growlers based at RAAF Base Amberely with initial operational capability (IOC) expected this year. Image Shayne Wright. description-10 = The RAAF's Growlers have a top speed of Mach 1.6 (1,960km/h) and a range of 1,570 kilometres when fully armed with external fuel tanks. The purchase of the Growler includes the aircraft, required mission and support systems, training, and ongoing support to effectively develop and operate a Growler capability. Image Shayne Wright. description-11 = The Boeing E-7A Wedgetail provides Australia with one of the most advanced air battlespace management capabilities in the world. Based at RAAF Base Williamtown, NSW, the six Wedgetails are capable of communicating with other aircraft and providing air control from the sky, and can cover 4 million square kilometres during a single 10-hour mission. Image Shayne Wright. description-12 = Based on the civilian Boeing 737-700 variant, the Wedgetail includes an advanced Multi-Role Electronically Scanned Array (MESA) radar, and 10 state-of-the-art mission crew consoles which can track airborne and maritime targets simultaneously. The E-7A Wedgetail can control the tactical battlespace, provide direction for assets in the air, at sea and on land, and support tanker and intelligence platforms. Image Shayne Wright. description-13 = The world's first fifth-generation fighter aircraft, the Lockheed Martin F-22 Raptor incorporates super manoeuvrability, low observability, speed, integrated avionics in an unrivalled air dominance platform. Originally slated to replace the F-15 Eagle with 648 aircraft, the program was subject to a number of cuts, ultimately resulting in 187 combat capable aircraft. Image Shayne Wright. description-14 = Used solely by the United States Air Force, the Raptor has a max speed of Mach 2.25 (2,410km/h), range of 2,960 kilometres and combat radius of 852 kilometres. The Raptor also makes use of supercruise, allowing the aircraft to accelerate to Mach 1.82 (1,960km/h) without the use of afterburners. Image Shayne Wright. description-15 = Lockheed Martin's F-35 Joint Strike Fighter (JSF) will serve as the back bone of Australia's future air combat capability. Australia has committed to acquiring 72 'A' variant aircraft as part of a $17 billion AIR 6000 program to replace the classic Hornets. Image Shayne Wright. description-16 = JSF's combination of full-spectrum, low-observable stealth coatings and materials, advanced radar-dispersing shaping, network-centric sensor and communications suites – combined with a lethal strike capability – means the aircraft will be the ultimate force multiplying, air-combat platform. Image Shayne Wright. description-17 = F-35 is powered by the Pratt & Whitney F135, an afterburning turbofan engine capable of generating 27,000 pounds of military thrust and 41,000 pounds of thrust with the after burner. F-35 has a max speed of Mach 1.6+ (1,930km/h) and range of 2,800 kilometres on internal fuel, with a combat radius of 1,239 kilometres. Image Shayne Wright. description-18 = The F-35 maintains its stealth profile by internally mounting weapons in two bays with a capacity of 2,590 kilograms. Additionally, the F-35 has six external wing hardpoints with a capacity of 6,800 kilograms, bringing the total payload to 8,100 kilograms. Image Shayne Wright. description-19 = The F-35 is also a major win for Australian industry, with the every one of the about 3,500 aircraft around the world built with Australian parts. Australian industry has already received over $1.2 billion worth of contracts shared by more than 50 Australian companies across manufacturing, training, maintenance and sustainment. Image Shayne Wright. description-20 = The Sikorsky MH-60R Romeo Sea Hawk helicopter is the Royal Australia Navy's next-gen anti-submarine and anti-surface warfare helicopter, replacing the fleet's S-70B-2 in 2017. Acquired as part of a foreign military sale from the US in a deal worth over $3 billion. Image Shayne Wright. The Avalon 2019 Expo and Airshow provided an opportunity for defence and industry to display the next-generation capabilities that will transform the Royal Australian Air Force in coming years. Air power established itself as the 'king of the battlefield' throughout the Second World War and as technology has evolved so too have air combat capabilities. 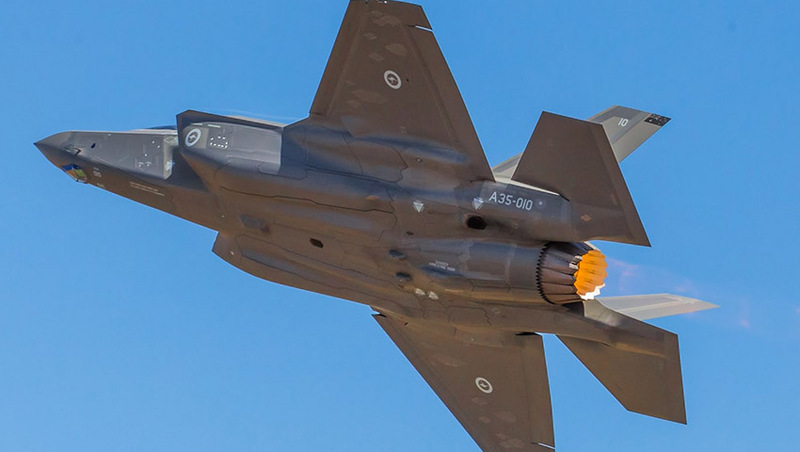 The Avalon 2019 Expo and Airshow provided defence and industry with the opportunity to demonstrate the next-generation of Australian and allied air combat capability. For the RAAF and broader Australian Defence Force, Avalon 2019 provided the opportunity to showcase a range of existing and emerging capabilities, from the tried and tested classic F/A-18A/B Hornets, which have been the backbone of the country's air combat capabilities since 1985, to the Navy's new MH-60R 'Romeo' Seahawk anti-submarine and anti-surface helicopters to the E/A-18G Growler and F-35A Joint Strike Fighter aircraft. The Avalon trade show also saw a number of capability reveals and demonstrations from global primes, namely Boeing Defence, which in partnership with the Defence Science and Technology Group (DSTG) revealed a world-leading 'loyal wing man' unmanned aerial system concept, which will support Australia's future manned air combat systems. The trade show days also provided an opportunity for the US, Japan and other allies to demonstrate capabilities ranging from the KC-135 Stratotanker and B-52H Stratofortress to the next-generation F-22 Raptor and Kawasaki C-2 tactical transport aircraft. Avalon 2019 Expo and Airshow provided Defence and industry with the opportunity to demonstrate the next-generation of Australian and allied air combat capability. Image Shayne Wright. A Royal Australian Air Force Airbus KC-30 Multi Role Tanker Transport (MRTT) conducts a low fly-by with a BAE Hawk Lead-in Fighter, Boeing F/A-18 Classic Hornets, a Boeing F/A-18F Super Hornet and the future of Australia's air combat capability, the Lockheed Martin F-35A Joint Strike Fighter. Image Shayne Wright. The Airbus-designed KC-30A MRTT is fitted with two forms of air-to-air refuelling and is capable of carrying more than 100 tonnes of fuel. KC-30A can refuel a range of compatible aircraft, including; F/A-18 Classic Hornets, F/A-18F Super Hornets, E/A-18G Growlers, E-7A Wedgetails and C-17A Globemaster IIIs. Image Shayne Wright. KC-30A can remain 1,800 kilometres from its home base, with 50 tonnes of fuel available to offload for up to four hours supporting Australia's expeditionary air power capabilities. The KC-30A is also compatible with refuelling P-8A Poseidon surveillance aircraft, F-35A Lightning II, and foreign aircraft such as the F-16C Fighting Falcon and B-1B Lancer. The RAAF's fleet of 71 'classic' Boeing F/A-18A/B Hornets have served as the back bone of Australia's air combat capability since their introduction in 1984. Based at RAAF Base Williamtown, NSW and RAAF Base Tindal, NT, the classic Hornets are operated by No. 3 Squadron, No. 75 Squadron, No. 77 Squadron and No. 2 Operational Conversion Unit. Image Shayne Wright. The RAAF Hornets undertake a variety of mission profiles, including air interception, air combat, close air support and interdiction operations. The Hornet has a top speed of Mach 1.8 (2,200km/h) with an interdiction range over 1,000 kilometres and a combat radius of 740 kilometres. Image Shayne Wright. Australia's fleet of Hornets have been supported by the introduction of the larger, twin-seat, Boeing F/A-18F Super Hornets. The RAAF operates a fleet of 24 Super Hornets based at RAAF Base Amberley, Queensland. Image Shayne Wright. Like the Classic Hornets, the Super Hornets undertake a variety of mission profiles, including air interception, air combat, close air support and interdiction operations. The Super Hornet has a top speed of Mach 1.6 (1,960km/h) with a range of 2,700 kilometres. The E/A-18G Growler is a specialised electronic attack variant of the Super Hornet. The RAAF operates a fleet of 11 Growlers based at RAAF Base Amberely with initial operational capability (IOC) expected this year. Image Shayne Wright. The RAAF's Growlers have a top speed of Mach 1.6 (1,960km/h) and a range of 1,570 kilometres when fully armed with external fuel tanks. The purchase of the Growler includes the aircraft, required mission and support systems, training, and ongoing support to effectively develop and operate a Growler capability. Image Shayne Wright. The Boeing E-7A Wedgetail provides Australia with one of the most advanced air battlespace management capabilities in the world. Based at RAAF Base Williamtown, NSW, the six Wedgetails are capable of communicating with other aircraft and providing air control from the sky, and can cover 4 million square kilometres during a single 10-hour mission. Image Shayne Wright. Based on the civilian Boeing 737-700 variant, the Wedgetail includes an advanced Multi-Role Electronically Scanned Array (MESA) radar, and 10 state-of-the-art mission crew consoles which can track airborne and maritime targets simultaneously. The E-7A Wedgetail can control the tactical battlespace, provide direction for assets in the air, at sea and on land, and support tanker and intelligence platforms. Image Shayne Wright. The world's first fifth-generation fighter aircraft, the Lockheed Martin F-22 Raptor incorporates super manoeuvrability, low observability, speed, integrated avionics in an unrivalled air dominance platform. Originally slated to replace the F-15 Eagle with 648 aircraft, the program was subject to a number of cuts, ultimately resulting in 187 combat capable aircraft. Image Shayne Wright. Used solely by the United States Air Force, the Raptor has a max speed of Mach 2.25 (2,410km/h), range of 2,960 kilometres and combat radius of 852 kilometres. The Raptor also makes use of supercruise, allowing the aircraft to accelerate to Mach 1.82 (1,960km/h) without the use of afterburners. Image Shayne Wright. Lockheed Martin's F-35 Joint Strike Fighter (JSF) will serve as the back bone of Australia's future air combat capability. Australia has committed to acquiring 72 'A' variant aircraft as part of a $17 billion AIR 6000 program to replace the classic Hornets. Image Shayne Wright. JSF's combination of full-spectrum, low-observable stealth coatings and materials, advanced radar-dispersing shaping, network-centric sensor and communications suites – combined with a lethal strike capability – means the aircraft will be the ultimate force multiplying, air-combat platform. Image Shayne Wright. The F-35 maintains its stealth profile by internally mounting weapons in two bays with a capacity of 2,590 kilograms. Additionally, the F-35 has six external wing hardpoints with a capacity of 6,800 kilograms, bringing the total payload to 8,100 kilograms. Image Shayne Wright. The F-35 is also a major win for Australian industry, with the every one of the about 3,500 aircraft around the world built with Australian parts. Australian industry has already received over $1.2 billion worth of contracts shared by more than 50 Australian companies across manufacturing, training, maintenance and sustainment. Image Shayne Wright. The Sikorsky MH-60R Romeo Sea Hawk helicopter is the Royal Australia Navy's next-gen anti-submarine and anti-surface warfare helicopter, replacing the fleet's S-70B-2 in 2017. Acquired as part of a foreign military sale from the US in a deal worth over $3 billion. Image Shayne Wright.